Everybody, including her mother, believes that Kate's father committed suicide. Determined to prove otherwise, Kate sets out on a fascinating and sometimes hysterical journey through antebellum law and medicine. Set in 1860s Nashville and told with a biting wit, determined Kate finally discovers the truth - but at what cost? Will she ruin her own life trying to defend the life of her dead father? Step back into the 1860’s, a time when the country was divided on the slavery issue and war seemed to be coming. A man was dead; people forgot or moved on, but to Kate, the father she knew deserved justice and the killer deserved to pay. When a strong-willed and determined young lady sets out to clear the stain of suicide from her father’s death and prove that he was murdered, little did she know what she would discover as she began to uncover the secrets that lurked under nearly every rock in town. They said Kate’s dad committed suicide because of bad business decisions that cost the family their livelihood, their dignity and the opulent home they once resided in in a distant city. Now all that was keeping her family afloat were her mother’s abilities as a backwoods healer, an experienced doctor of herbal medicine. When the son of a powerful and wealthy man takes an interest in Kate, she sees an opportunity for aid in her quest for justice with the help her lawyer father-in-law could give her. It was time to leave her childhood behind, including her best friend, a quiet, hardworking country boy. But is this the life she wants? Is it worth losing herself in a world she doesn’t’ belong? When the truth comes to light, will Kate be able to feel justice was done? The world is changing all around her, people are changing, relationships are changing and just maybe Kate’s young eyes have been opened to the world around her. 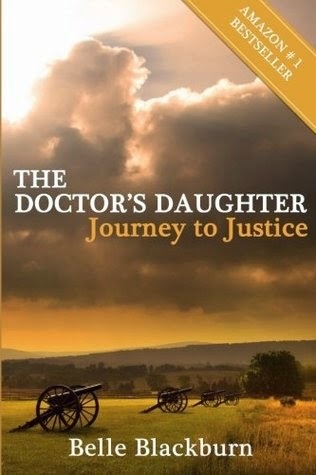 The Doctor’s Daughter: Journey to Justice by Belle Blackburn is a moving tale of a time long past, filled with atmosphere, as one can feel the era, see the dust, the town and feel the electricity in the air as war becomes a certainty. With the careful detail to each scene, each character and the amazing dialogue, I felt a time warp had been opened and I was a part of this era. I heard the wagon wheels, the coaches go by, and even felt the interaction of the characters. Not a book to be rushed through, but to be read and enjoyed, each page uncovered another layer of the many subplots running together to the final conclusion. Kate is a young woman ahead of her time, but her lack of life experiences becomes so vital to this tale, that she almost walks off the pages on her journey to adulthood. Well done, Belle Blackburn! Historical fiction readers are going to love this! I received this copy from Belle Blackburn in exchange for my honest review.